Love is hard. And it’s even harder when you’re caring for a dying family member, especially your mother. Here’s an essay I wrote for the Texas Observer about end-of-life care and my grandmother’s life (and death). 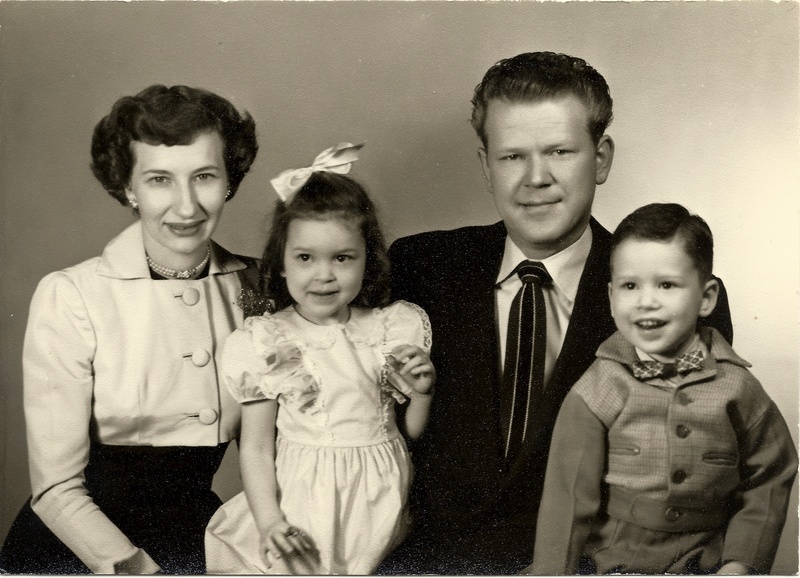 Betty with daughter, Karen, husband, Jerry, and son, Jerry. She’s naked from the waist up when we enter the room. The sheet on her twin-size bed has slipped from the curve of her slight shoulders down to the small of her back—quietly hinting at the soft round flesh just visible beneath the cheap white bedding. She’s curled up in the fetal position, facing the wall. The bare skin of her back is taut and creamy, seemingly youthful despite its age. A nurse’s aide from Green Valley Healthcare and Rehabilitation Center came into the room and helped get my grandmother out of bed and into a nightgown. It was lunchtime. My mother and I had brought her favorite meal, sparing no expense and withholding no calories: Grandy’s fried chicken with mashed potatoes, biscuits and gravy, fried cherry pie and Sprite. My mom cut up the chicken and biscuits and fed my grandmother baby bites with a plastic fork. I held the straw as she sipped the Sprite. Crumbs and wayward chicken scraps slipped from feeble lips down into her lap, making grease stains on the blanket she always needed to warm her tiny legs. The scene reminded me of feeding my daughter, Amelia, who was then just 2. Food always covered her chubby cheeks and dribbled gently onto her bib, the floor, and usually—somehow—found its way onto my shirt or into my hair. I took care of Amelia the same way my mom was now taking care of her mother. But while Amelia was getting stronger, more independent and more beautiful by the day, my grandmother, now 91, was fading away. Love is not always pretty. For my mom, it was sad, depressing and, at times, disgusting. But love was always present: in every touch, in every decision, and in every forkful of fried chicken she fed to my grandmother. This had been my mother’s life for the better part of three years, and it was taking a toll.